What happens when you hold a meeting about better bus service but bus riders don’t show up? Residents of Kew Gardens Hills packed an open house last night in a near-panic about the carmageddon they fear if bus lanes are installed on Main Street in their neighborhood. While the crowd last night was big and boisterous, very few regular bus riders turned up. Residents of other neighborhoods along the route who would benefit most from bus lanes — a key component of Select Bus Service plans — were also scarce last night. In the absence of a pro-transit constituency, City Council Member Rory Lancman and Assembly Member Michael Simanowitz fed the crowd’s perception that giving more street space to buses would cause a traffic disaster. The SBS supporters who did attend said transit riders should get a chance to weigh in before decisions get made. However, Transportation Commissioner Polly Trottenberg, who was in attendance, seemed prepared to back off bus lane plans for the neighborhood already. DOT has been mulling Select Bus Service between Flushing and Jamaica for routes on Main Street, Kissena Boulevard, Parsons Boulevard, and 164th Street. Last night, the agency narrowed its focus to the Q44, which carries 28,700 riders each day. The route travels between Jamaica and the Bronx Zoo, following Main Street through Flushing. 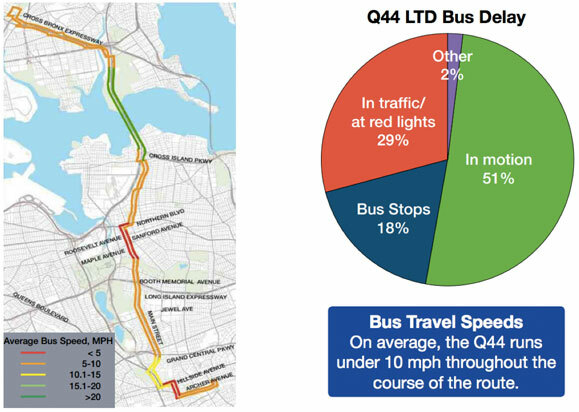 The project will upgrade limited-stop Q44 service to a full SBS route, including off-board fare payment, traffic signals that hold a green light for buses, and pedestrian safety upgrades at key intersections, all of which were well-received at last night’s meeting [PDF]. Rory Lancman and Michael Simanowitz don’t think anything can change the car dependence of their districts. DOT and the MTA have now added bus lanes to more than half a dozen major streets for SBS routes. Nowhere has carmaggedon ensued. On Webster Avenue in the Bronx, for instance, general traffic moves just as fast as it did before, but now the tens of thousands of people who ride buses every day get where they’re going faster. Other local electeds, including Assembly Member Nily Rozic, have urged the city to think boldly about bus improvements for Eastern Queens, and not all of the commentary last night was so obstructionist. Michael Herstein lives in Kew Gardens Hills and sometimes rides the Q44 to his job in the Bronx. He said the buses don’t get stuck in traffic in his neighborhood but do slow down through downtown Flushing, which is where the city should focus on putting bus lanes. “Put the solutions where it’s going to help,” he said. While DOT Director of Transit Development Eric Beaton said the agency will be doing additional outreach to communities in Flushing and Jamaica, Transportation Commissioner Polly Trottenberg indicated that last night’s event has already influenced her thinking about the project, at least in areas near Kew Gardens Hills. The de Blasio administration has promised 13 new Select Bus Service routes in four years. Since taking office more than a year ago, it has cut the ribbon on just one route. In addition to the Q44, SBS routes are in development for Woodhaven Boulevard in Queens and Utica Avenue in Brooklyn. A planned SBS upgrade for the M86 will not include bus lanes. Update (January 30, 2015): DOT says Select Bus Service could launch on the Q44 no earlier than fall 2015. The Q25, which runs on Kissena Boulevard, has also been identified as a candidate for SBS at a later date. Memo to Messrs. Lancman and Simanowitz. “Green Lines” have been bought out by the MTA. There’s no longer a need to protect their turf against NYC Transit improvements. The issue as usual is a DOT that cowers at the first sign of resistance. If de Blasio only plans to enact policies that draw zero opposition from bottom-feeders like Rory Lancman and Dan Zweig he should shitcan his transportation agenda now and stop wasting everyone’s time. At least then we’ll know where things stand. If what you suggest meets with “vicious opposition,” that means you need to get out there, educate people, show them how you’re actually helping to avoid carmageddon, not bring it about. You need to convince this Simanowitz character that the inevitable increase of cars on the road he’s expecting is a problem that we can and need to fix, and it’s one that we fix by making transit work for people. You need to point Lancman to all the people who would love to ride the bus to the grocery store – maybe for the few things they can’t get at a closer store, maybe for their regular shopping, maybe from farther away – rather than deal with all the crap that driving requires. Part of dealing with vicious opposition is not to keep mentioning it. At most you can say, “That’s why I’m here: to listen.” But at the end of the day, leaders need to lead. I wonder if it’s even worth it for her to show up to these things all the time if she’s just going to roll over at the first sign of opposition. Then again, if the mayor doesn’t have her back, I’m not sure what she’s supposed to do. She’s only going to convince people if she’s convinced he’s going to stand by her when the going gets tough. I’m not so sure the mayor wants to keep his BRT promise or anything related to helping New Yorkers who can’t or don’t rely on cars. Tale of two cities indeed. Without leadership, New York is screwed. I would think most of the places where one would load a trunk full of groceries would have off-street parking. Back when I lived in Brooklyn, I never saw anyone using curb space for supermarkets. Seems like a misinformed argument on how most folks would actually purchase groceries. Between Bowne, Townsend, and Queens College I’m not sure a majority of Kew Gardens Hills Q44 stop boarders are local residents. Quite possibly the MTA decided to use its rush hour service guidelines for sizing the meeting room. The result was similar to a rush hour F train during a service alert. The crowding was not conducive to civil discussion. The presentation would have been a disaster had even one tenth of the people shown up. There was no Powerpoint presentation followed by discussion in smaller groups. People were gathered in groups that were led by a presenter to view a series of poster boards. The poster boards were held on easels that collapsed whenever someone looked at them cross-eyed. The presenters did not know the material in detail. The public was far better informed, which insulted their intelligence. There were also errors in what was shown on the poster boards. The first error is how many people currently use the Q44 in the area to be affected. It’s not the figure of 68,000 given on page 6 of the presentation with the pdf link in the article. Nor is it Mr. Miller’s figure of 27,800. Both figures refer the the entire Q44 route – not the section between Flushing and Jamaica. That number has not been released, however there are a couple of ways to figure it out. The graphic in the article shows the Q44 route distance between Flushing and its Bronx terminal to be a little longer than the distance between Flushing and the Jamaica terminal. It would not be unreasonable to assign local ridership in proportion to distance covered. A similar result can be obtained by studying the Q44 timetable but assigning local ridership on the basis of time instead of distance. The presentation’s page 8 shows another way of eyeballing how many people use the Q44 in the corridor. This diagram shows how many people get on and off at each stop of the Q44-LTD. The actual number are not given. The number of people is represented by the size of a circle. The percentages getting on or off are shown as a pie chart. That also suggests that half the Q44 ridership uses the Q44 between Flushing and Jamaica. This places the number of riders directly affected by changing the Q44 service from limited to SBS to be around 14,000. Mr. Miller also copied the presentation graphic that shows the average Q44 to be between 5 and 10 mph throughout most of its route. He neglected to show the graphic on page 9. This graphic shows the car travel speed between Flushing and Jamaica over the Q44 route from Roosevelt to Queens Blv (Briarwood). The graphic shows that car speed is in excess of 20 mph in almost all places, presumably when the Q44 is travelling less than 10 mph. The fact that car speed is in excess of 20 mph contradicts the need for a dedicated bus lane. What ever is keeping average bus speed below 10 mph, it isn’t traffic. Dedicated bus lanes are useful when traffic is moving slowly – e.g. Second Ave in Manhattan. If the traffic is moving at 5 mph, a dedicated bus lane might allow a bus to average 12 mph. If traffic were already moving at 20+ mph, a dedicated bus lane won’t make any difference. The speed limit for buses is also 25 mph just like every other vehicle. This graphic does show that Downtown Flushing is slow for all vehicles. It’s been that way 60 years ago, when I first took the Q44 into Flushing. The one big difference is there is now pedestrian congestion as well as vehicle congestion. Main St. is undergoing a road diet in Downtown Flushing to accommodate the pedestrians. Supposedly DOT is using “intelligent” control for the traffic lights. I have not detected any improvement. That graphic refers to how time is spent? So 29% is stuck in traffic/red lights, only 51% of the time buses are in motion? Going by the car travel speed graphic in the pdf a lot of the delay, at least in KGH, is from getting stuck at lights. Not sure most of the delays would be helped by a bus lane as streetsblog alleges. In a few stretches better synchronizing lights or managing turns could speed traffic generally. Maybe on some stretches bus bulbs at SBS stops would be worth building if a bus lane is too opposed by the community. Off board fare payment and all door boarding could help a lot, especially when school lets out. re parking: For those not familiar with the area some of the commercial stretches of main between union and the LIE have a service road. It’s not a through street, it’s two lanes of metered parking and an access road. It would be unaffected by a bus lane. If the grocery store they’re talking about is Seasons, it would still have curbside parking. I think some of the meters still allow two hour parking, cutting it down to one and adding spots around the corner could make up for losing some to a bus lane. Especially near Queens College residents have a hard time finding parking when classes are in session. Residential parking permits could help. There are some meters near QC, adding more metered parking in the surrounding area could help, maybe exempting residents from paying or any time limits. So the residents of Kew Gardens Hills are against buses, indifferent or hostile to the people who need them, in favor of cars, and desperate for more parking. And those living elsewhere want better bus service. Here is the win win. Eliminate bus service in Kew Gardens Hills, speeding the trip past the area. When people complain, blame Lancman and Simanowitz and tell them to use cars. As on PPW, the driving NIMBYs win more parking when the bus stops are removed. The 20A and 20B could be shifted over to Kissena south of the LIE. The Q44 limited could run on the Van Wyck and its service roads between Union Turnpike and Flushing. The Van Wyck is one of those “never use” roads south of the Kew Gardens Interchange, but usually moves to the north. By the way, how cost effective is that QM 4 bus, in terms of how much of its cost is covered by fares, compared with what other New Yorkers have to cover? Since a powerful part of a community is car obsessed those residents who use transit as well as all the college and high school students who do should get fucked over ? I would love to know what “nightmare” scenarios were drummed up to scare people into crowding the hearing to block progress. People getting hit by buses? Easy access to the neighborhood by [pick an ethnicity] from [pick a neighborhood]? Grandmothers who will die because they can’t make their doctor visits? If there is no accountability because of apathy, this sort of thing is what you will get. I consider the political flip flops on 125th to be an example of what works. Resources are scarce, and throwing more of them an those who whine and make trouble is a way to get more whining and troublemaking. About the only excuse I can think of for the vast majority of the decisions that have been made in Albany and Washington for 20 years is that people who don’t bother to participate (future generations for example) deserve to get screwed. And that elections have consequences. I don’t agree with it, but I don’t see how people like City Council Member Rory Lancman and Assembly Member Michael Simanowitz — not to mention Sheldon Silver — can justify what they’ve done otherwise. Community Board members can be dismissed as cranks. These men were ELECTED. Leadership would require doing something about that. One reason why the community is suspicious is that there are only 2 Q44-LTD stops in KGH. Jewel and 73rd Aves. Both are/were transfer points to other buses. Limited bus service has been a disaster because the local service is less frequent. To me, it seemed as though numerous people believed a secret plan was already in place and that the DoT was refusing to show it to them. I have to say I was quite surprised at how the elected officials and some of the community members behaved, it reflected very poorly on them and on Eastern Queens as a whole. At the beginning of the meeting, Lancman got up on a chair and essentially turned a DoT/MTA community workshop into his own rally against dedicated bus lanes in Kew Gardens Hills (KGH). After whipping the crowd into a frenzy, both he and Simonowitz were at pains to encourage folks to be polite and behave themselves. As you might expect given such a beginning, many of the folks who crowded the meeting early on were quite rude. Those folks cleared out after about an hour and most of the folks who were left over believed a dedicated bus lane was of no use in their community and most of these folks were angry but respectful. The folks from KGH who were respectful mentioned that the community couldn’t use the busses on Main St because the busses get filled in Downtown Jamaica or Downtown Flushing and there’s no room for them on the bus. Faster and more frequent bus service would probably do more to fix that than anything. I should also mention that the MTA does need a dedicated lane approaching both Downtown Flushing & Jamaica but I’m not sold on the need for a dedicated bus lane in KGH. What bus used to be on 73rd? Isn’t there a limited stop on Melbourne too? Southbound the buses (and traffic generally) really crawl leading up to union. Did they mention any solutions to this at the meeting? If you had a bus lane there the bus would still get stuck behind all the cars turning right onto union. Vleigh Place Shuttle (aka Q74, Q44VP, Q44) diverged at 73rd & Main St.
I’m looking at the 1.2 miles between Melbourne and Union Tpk. There are 9 stops on the Q20A/B and 2 on the Q44-LTD.
Actually AHWR, the KGH folks I spoke with mentioned the intersection of Union & Main as a trouble spot that needs fixing. The reason for low bus ridership attendance is most likely because most riders are students of Queens College or graduates living there taking the train into the city – two demographics that dont care about public meetings. Where would someone be coming from that a transfer to/from the 74 at 73rd would be needed, that the trip would not be served just as well by a transfer at Jewell or union via the 46? It’s a mile from Jewell to union, you’d want a limited or SBS stop in between. If the community wanted a second I suppose you could get rid of the 73rd stop and put in two new ones, at 72nd and 76th avenues.